Last year, word trickled out that Saucony was getting into the TPU game (a la Adidas Boost), and so I put off getting the Kinvara 6, in the hopes that the new Everun TPU foam used by Saucony would give the shoe enough rebound to be viable as a marathon racer. Eventually, it turned out that the K7 would only be using a TPU heel wedge instead of a full length TPU top-sole (as seen in the Triumph ISO 2, and Ride 9). 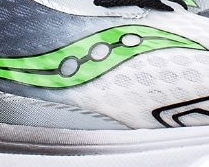 Nevertheless, I was curious as to how Saucony’s attempt at TPU usage would fare. As an aside, I went out and got the Puma Ignite fairly early when it first hit the stores, and was sorely disappointed by their execution of what was claimed to be a full length TPU midsole; the shoe was overly firm with very little “give” (and there can be no rebound without “give”). My K7 came in at 228g for a US9.5, 8grams heavier than the K5 in the same size. This is by no means heavy for an uptempo trainer. For comparison, the Adios Boost comes in around 230g for my size. I have no problem accepting a weight gain, but that gain must come with some tangible benefits. The upper is composed largely of a relatively thin and well ventilated open mesh, with very few overlays. The Tokyo Marathon edition I bought has some graphics on the rear 1/3 and this, I felt, made the material a little more rigid but is not really noticeable when shod. The tongue and heel are both well padded, and the overall shoe volume is on the roomier side for me, compared to e.g. Nike/Adidas. The midsole is composed primarily of Saucony’s premium SSL EVA foam, which is single density and runs almost the entire length of the shoe. The Everun TPU heel insert complements this to give some added spring in the rear. One of the key updates to the K7 is in the outsole. While earlier editions favoured a pod-like outsole design, there was a migration towards a chevron pattern for 2016. Keeping with the tradition of previous Kinvara iterations, there is a lot of exposed EVA on the outsole, mainly in the medial arch and heel. Blown rubber is strategically placed at the medial forefoot this time (white in this shoe) instead of the mid-forefoot as seen in the Kinvara 5 below, with more durable carbon injected rubber in the heel and right at the tip of the forefoot. This is exactly where you would expect a pure neutral runner to land; supinated on heel or midfoot strike, then pronating naturally as the foot rolls forward, and toeing off with the greatest forward propulsive force stemming from the ball of the foot, harnessing the energy of the Windlass mechanism. There are multiple grooves in the outsole interspersing the rubber pads, and these serve to add some flexibility to the shoe, as the foot flexes during the stride cycle. I have found the overall fit to be true to size. The relatively large footprint of the shoe, and low arch pattern lends itself well to fitting Asian feet. The heel is relatively high volume, and which most people should find it adequate not to have to utilize the heel loop lacing pattern, I did find better lock-down in the heel with this lacing style for this shoe. I have put over 200km on this shoe thus far, and my first impression from the outset was that the ride is firm. The shoe did start to soften just a tad after the first 30-40km, but I would still definitely classify this shoe as a firm responsive shoe 200km later. This was surprising to me, as it was a big departure from the K5 I had worn previously which was softer and your feet sank in quite a bit more with each step. In this shoe, I felt very little “give” in the shoe on footstrike. This is not necessarily a bad thing for an uptempo shoe, which is what the K7 is classified as by Saucony, but it is still a surprising move by Saucony, given the cult following the Kinvara commands, as a soft, flexible uptempo shoe. There is some nice rebound and cushioning in the heel, but one would really have to heel strike to feel this benefit. I forefoot or midfoot striker would hardly notice the Everun in this shoe. The midfoot/forefoot ride and transition are smooth, fast and consistent, and work best at uptempo paces. I did try to use the shoe for one longer 20+km run and felt sore in the quads after the 15km mark in this shoe. Overall, I must confess that I prefer the ride of the K5 over the K7. Ironically, what doesn’t work for a training shoe might in fact work well as a racing flat for e.g. 21km. For a shoe designed for a pure neutral runner with a low drop, I think the Everun would have been better served as a top-sole in the forefoot or even a forefoot wedge a la Adidas Takumi Sen/Ren Boost. I highly doubt you are going to find many heel strikers going for a 4mm drop shoe. In this regard, I felt there was a bit of conflict in the design philosophy of the different elements of the K7. The K7 definitely uses a higher durometer EVA (firmer) foam than the K5 (not sure about the K6). As is, I think the K7’s EVA sans Everun would be excessively firm for anything other than uptempo use. They would have been better served sticking to a softer durometer, and then sticking a forefoot wedge Everun. That would be my ideal Kinvara. It should also be noted that the shoe does suffer from added stiffness due to the firmer EVA, and lacks the flexibility of the K5, despite their best efforts with the flex grooves. Durability-wise, I am starting to see significant wear in the white blown rubber chevron segments in the medial forefoot (left side of the picture), as well as the exposed EVA (also in white; right side of the picture). Even the carbon injected rubber (in green) at the heel is starting to see some wear. The denser EVA may lend itself to better cushioning durability in the K7 but my suspicion is that the blown rubber and EVA will be the deciding factor in how long the shoe can last for most people. I predict that my shoe would not last beyond the 500km mark. In summary, the K7 has become more performance-oriented rather than a soft uptempo shoe, sporting a firmer snappier ride with decent grip. Durability continues to be an issue for the Kinvara but that has never deterred its fans from buying it. I do hope that the shoe reverts to its original roots as a softer, flexible uptempo shoe, as there are so few of those on the market these days. Skechers GoRun 4 – very similar overall feel, though the K7 has a more forgiving fit and higher overall shoe volume. Mizuno Wave Hitogami – the Hitogami is marginally stiffer and firmer as a shoe, but also has a bit more bounce in the forefoot. Similar fit for both. New Balance Vazee Rush – this shoe is heavier than the K7 by almost a full ounce, but has the closest forefoot and heel softness of the NB range. The Vazee Race is significantly firmer than the Rush, while the Zante has a much softer forefoot and firmer heel than the K7. The Vazee Rush seems to be more durable in terms of outsole wear than the K7 but the trade-off comes in the weight penalty. ASICS Skysensor Japan – identical weight to the K7, and quite similar feel in terms of a consistent relatively firm ride, and smooth transition. The Skysensor Japan is more rigid due the presence of much more blown rubber coverage on the outsole. The Skysensor also has a much higher volume fit, with more flexible materials in the mesh, and would work better for wider feet. 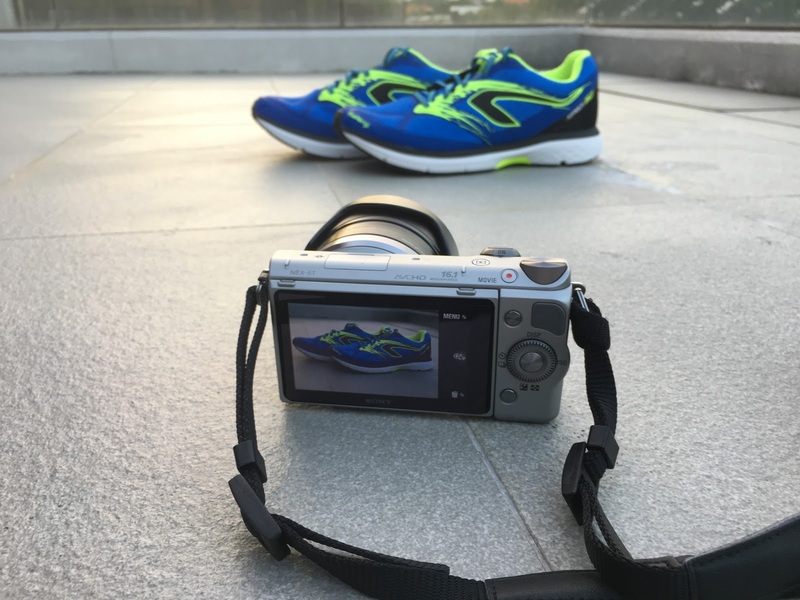 The Kinvara 7 is now available in Royal Sporting House stores in Singapore. K9 has been getting great reviews, what's your take on this.? I'm a novice marathon runner, my shoes varies from nike zoom fly , on cloudsurfer and recently zoom fly knit. However my running buddies are mostly running in Asics skysensor Japan, you mentioned in your article, as a racing shoe ' asics skysensor glyde' what's the difference between glyde vs japan. ?